The Grapevine Delivers . . . Tomatoes. 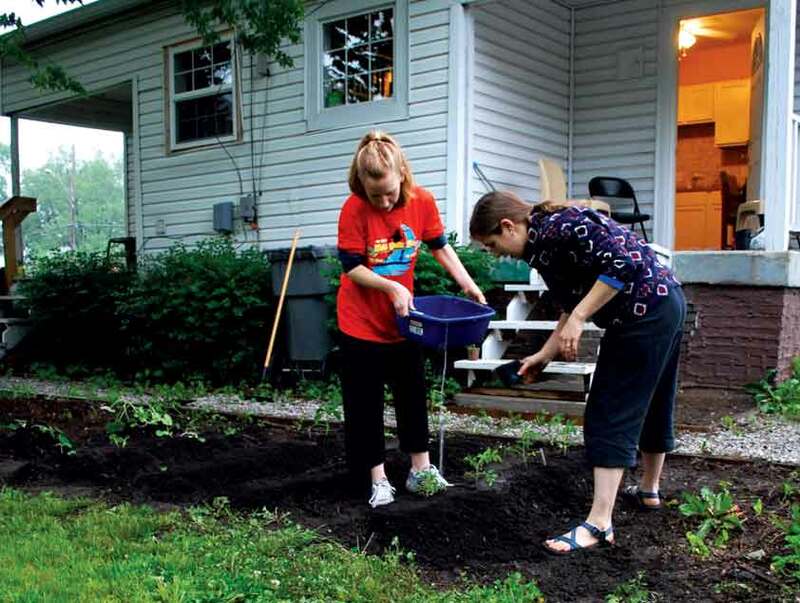 The Triangle area of Indianapolis wanted fresh vegetables, so this spring Jenny Sergio and Trish Brewer planted a garden—several varieties of tomatoes and peppers in five neat rows behind the duplex. But one Sunday morning in late May Jenny awoke to discover that that their plants had gone missing. “There were just holes left in the garden,” Trish remembers. Walt followed the alley behind the duplex, but saw no plants. A few days later, on Wednesday, as Trish walked from her car to the duplex, another neighbor rode up on his mountain bike. A single full beer can dangled from either side of the handlebars, attached there by two six-pack rings. “Really? That’s very generous of you,” Trish said. “It sounded exactly like what Walt had told Walter,” Trish remembers. She thought the plants looked familiar, but she couldn’t be sure. In any case, the Triangle now has a bigger garden than before the heist, thanks to the three tomato plants and some more vegetable plants donated by an Indianapolis branch member. “We added a whole extra row to the garden,” Trish says. I'm a gardner too, and I would hate to think my veggies were stolen. Praise God for His loving provision through the care of neighbors. Had a similar situation. Rose of Sharon bush got chewed in half overnite!The back yard is fenced and I have 15" on either side of the bulilding. What a surprise, when I woke up----thieves sometimes work better at night--matter a fact if it's cool they where dark coats. That deer, look me in the eye and probabely said under his breath--thanks for coming and fast as a greesed deer could go out between 15"walls and gone. Brothers and Sisters--He's holy--after all its a blessed bush! It is obvious that GOD is in control and the whole neighborhood knows that the people who live in that white duplex are God's people. His glory is all over you -praise be to God!